Oh who’s a pretty boy? 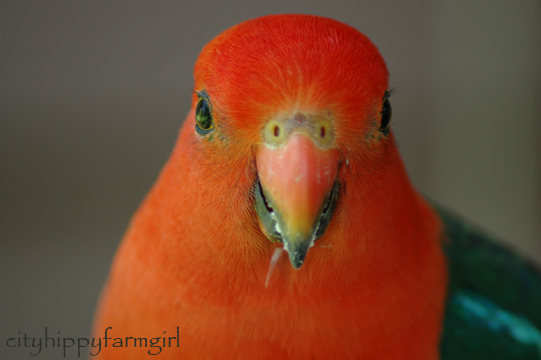 What does he (the King Parrot) sound like? 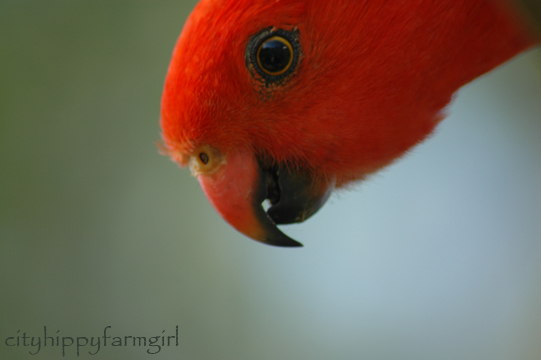 This entry was posted in Connecting with Community and tagged australian birds, bird photography, king parrot by cityhippyfarmgirl. Bookmark the permalink. isn’t he beautiful! Great close-ups Brydie, I’m a bit wary of getting that close to a sharp beak! Thanks Celia. He was so calm, eyeing us off, beak and all. Although we get them here, this little fella was down at my mums. Very confidently striding about, nicking her grapes off the vine and then having a look to see if I had anything on offer as well. He probably would have had a burger with the lot! A very pretty bird, but a slightly limited repertoire of noises! Will he learn to talk, do you think? Nah, he doesn’t need to, he knows he’s the ‘King’. Just a wild bird at my mums that decided he and his mate needed a closer inspection of a whole verandah full of grapes. 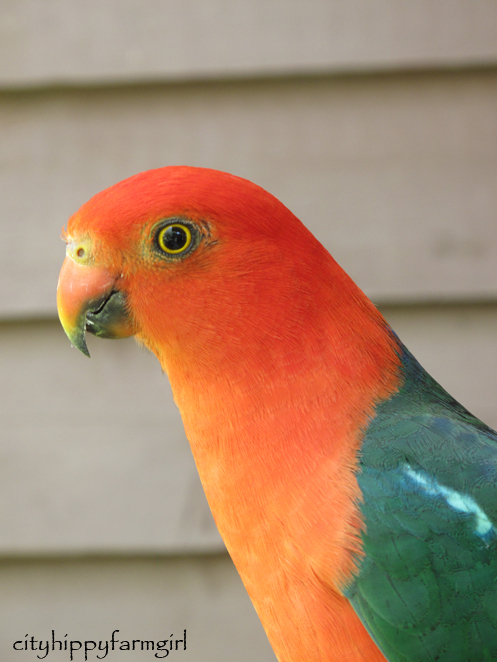 I think if I lived in Australia I would be a bird watcher! Aaahhh, I love them too. No idea what noise they make but they come & land on our courtyard wall & sit up in the trees, so beautiful. If you click on the link Anna you can get to hear them. Not the most exciting call but their beauty makes up for it! These photos are gorgeous. You have captured the colours beautifully.